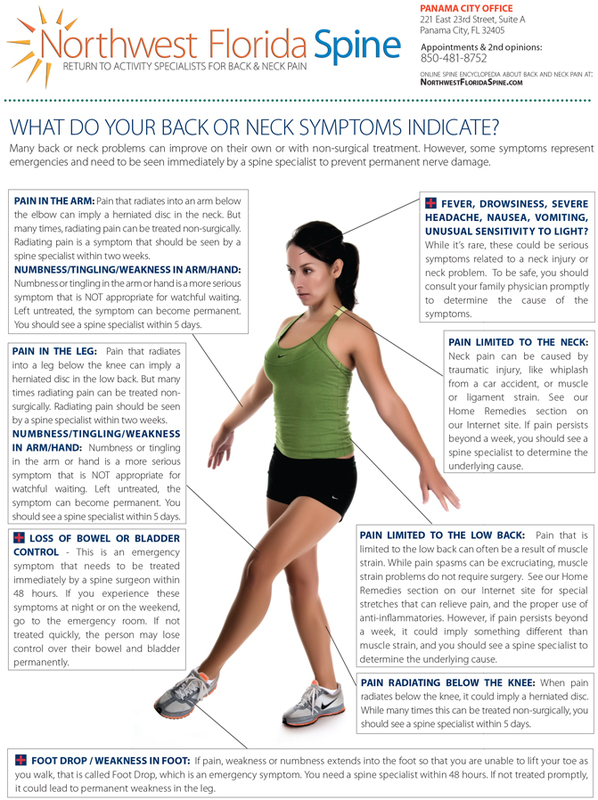 Is back pain keeping you off the golf course this year? Is back pain, or the fear of back pain, keeping you away from golf? If so, Northwest Florida Spine can help. Here are some helpful tips to get you back on course. This includes golf stretches that make the back stronger, more flexible and resistant to future strain. Fact: A correct golf swing should not create a back problem. We recommend connecting with a PGA-certified golf pro to learn the correct swing mechanics to lessen the strain on your back. Request our free Home Remedy Book at PanamaCitySpine.com. Back in the 1970s the fashionable swing of young Johnny Miller featured the spine bent backward in the follow through, resembling a backward C. Today, the modern golf swing is much easier on the back, and positions the back in a more straight-up position as the body rotates on a straight left leg. Ironically, as Johnny Miller aged, he too changed his swing to a more rotational swing that has a finish that’s easier on his back. Are slow players up ahead? Perfect! 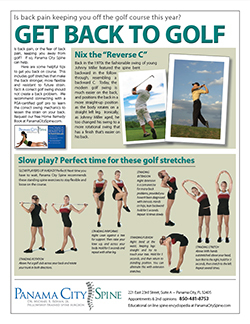 Next time you have to wait, Northwest Florida Spine recommends these standing spine exercises to stay flexible and loose on the course. Above: Put a golf club across your back and rotate your trunk in both directions. Right: Lean against a tree for support. Then raise your knee up, and across your body. Hold for 5 seconds and repeat with other leg. Right: Extension is a core exercise for many back problems, provided you haven’t been diagnosed with stenosis. Hands on hips, lean backward hold for 5 seconds. Repeat 10 times slowly. Right: Bend at the waist, keeping legs straight and try to touch your toes. Hold for 5 seconds, and then return to standing position. You can alternate this with extension stretches. Above: With hands outstretched above your head, lean first to the right, hold for 3 seconds, then stretch to the left. Repeat several times.